MANOVA (Multivariate Analysis of Variance) is used to model a combination of dependent variables. 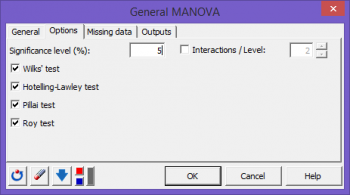 Use MANOVA in Excel with the XLSTAT software. Multivariate ANalysis of VAriance (MANOVA) uses the same conceptual framework as ANOVA. It is an extension of the ANOVA that allows taking a combination of dependent variables into account instead of a single one. With MANOVA, explanatory variables are often called factors. The advantage of the MANOVA as opposed to several simultaneous ANOVAs lies in the fact that it takes into account correlations between response variables which results in a richer use of the information contained in the data. The combination of dependent variables may represent a variable that cannot be measured directly. The MANOVA tests the effect of factors on several response variables. MANOVA also enables the simultaneous tests of all hypotheses tested by an ANOVA and is more likely to detect significant factor effects. Furthermore, the computation of several ANOVAs instead of one MANOVA increases the Type I error which is the probability to wrongly reject the null hypothesis. The potential covariation between response variables is not taken into account by several ANOVAs. Instead, the MANOVA is sensitive to both the difference of averages between levels of factors and the covariation between explanatory variables. And a potential correlation between response variables is more likely to be detected when these variables are studied together as it is the case with a MANOVA. Where yijk is the kth observation of the ith level of A and jth level of B, e is the error of the model. The hypotheses used in a MANOVA are identical to those used in linear regression: errors ei follow a normal distribution N(0,s) and are independent. To use the various tests proposed in the results, it is recommended to check retrospectively that the underlying hypotheses have been correctly verified. The normality of the residuals can be checked by analyzing certain charts or by using a normality test. The independence of the residuals can be checked by analyzing certain charts or by using the Durbin-Watson test. One of the main application of the MANOVA is multivariate comparison testing where parameters for the various categories of a factor are tested to be significantly different or not. For example, in the case where four treatments (factors) are applied to plant fields, we want to know if the factors and/ or their interactions have a significant effect on a combination of dependent variables depicting production quality. Summary statistics: The tables of descriptive statistics show the simple statistics for all the variables selected. The number of observations, missing values, the number of non-missing values, the mean and the standard deviation (unbiased) are displayed for the dependent variables (in blue) and the quantitative explanatory variables. For qualitative explanatory variables the names of the various categories are displayed together with their respective frequencies. SSCP matrices: These tables are displayed to give a general view of the effects of the factors and interactions between factors. 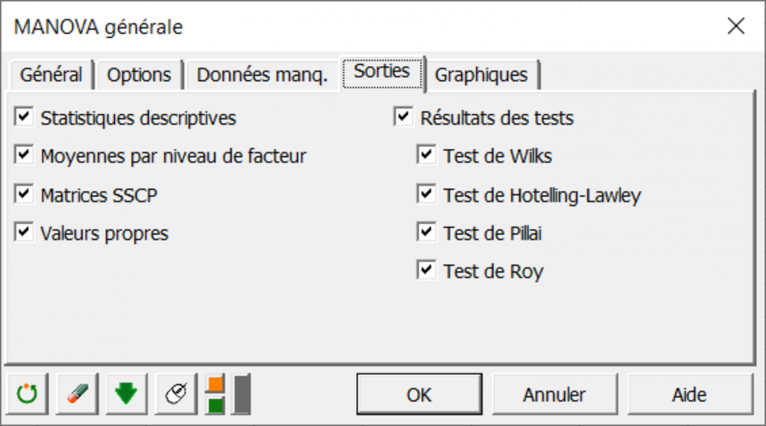 When a k-way MANOVA is applied and the corresponding option is enabled, the results of the multivariate tests are displayed. The associated statistics, the degrees of freedom and the p-values are displayed.